Glass is one of the least reactive substances known to chemistry. It is the standard container material for almost all lab chemicals because it's so inert. But there are a couple of substances that have strong reactions with glass. 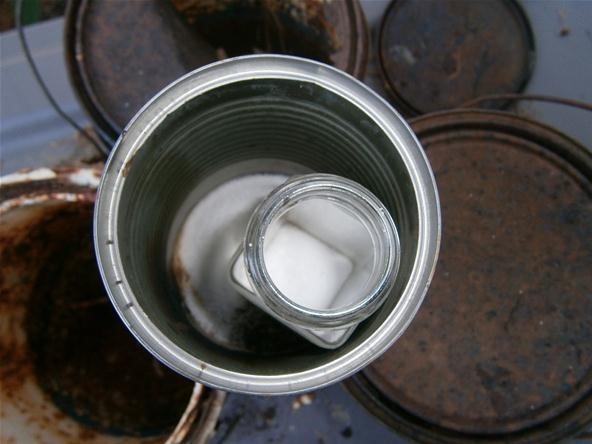 Sodium hydroxide, aka solid drain cleaner or lye, can easily be stored in glass as a solid, but when molten, it reacts violently with glass and can actually dissolve it away! So, the next time you clog up your drains with broken glass beakers and flasks, rest assured your household drain cleaner has what it takes. Some glass is thicker than others. For the most dramatic results, try to pick a thin-walled glass bottle or jar. Be sure that all labels are removed from the area you want to dissolve. This will give the sodium hydroxide more surface area over which it can react. While the molten sodium hydroxide will dissolve glass, it will not react with steel. Just about any soup can or cat food tin will work as a dissolving chamber. Aluminum will not work, as it would dissolve. Test the metal container with a magnet to be sure it is magnetic and therefore steel. 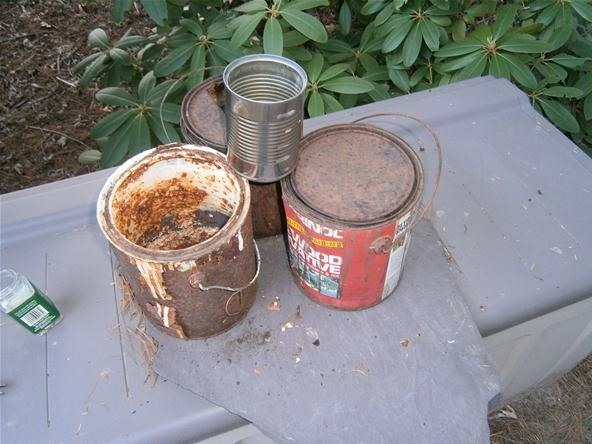 Set your steel container on top of something nonflammable to expose the bottom to the propane flame. I used these old paint cans to hold up my chamber. Pour a tiny amount of lye inside so that it covers the bottom of the can. Next, fill the bottom of the jar with lye. 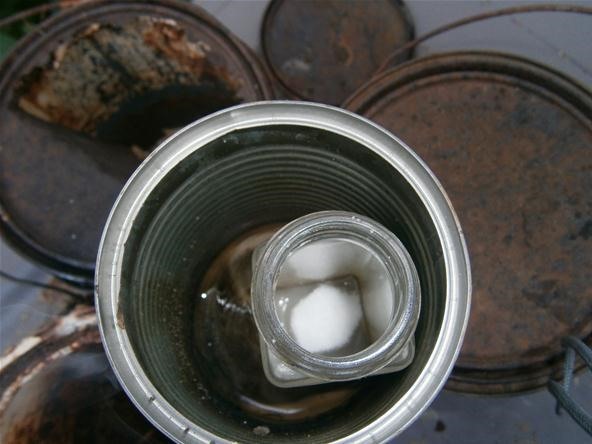 Place the jar inside the can and begin heating the bottom with the propane torch. The reaction can take a few minutes and may require that you add more sodium hydroxide as you go. Above, the lower lye has melted and the lye inside the bottle as begun to liquify. Below, all molten! Now we wait for the glass to dissolve. This project is for display purposes only. Do not attempt this project at home. I am not responsible for any injury or death that comes as a result of repeating this project at home. The fumes produced can be harmful, so be sure you do this in a fume hood or outside with proper respiratory protection. Molten sodium hydroxide is extremely corrosive to human flesh. Cover all parts of your body and face while heating the can. The liquid lye eats away at both the inside and the outside of the glass. The sodium hydroxide and the silicone dioxide in the glass react to form sodium silicate. In heated liquid mixture, this new sodium silicate dissolves away leaving only a hole in the glass. Hypothetically, if you have a steel print with channels for the sodium hydroxide to flow into, you could do intricate glass etchings this way. What would you do with the power to dissolve glass? Let us know in the forum or post your own video to the community corkboard. How To: Replace Galaxy S4 Screen Glass! I realized after I made the video that using a tuna can as a container makes it a lot easier to see the reaction. You list sodium nitrate as the compound used for this in several areas. It is not. Sodium hydroxide is the chemical that can be used for glass etching, which you get right in the materials section. It is a totally different chemical than sodium nitrate though. Nitrates cannot be used to etch glass. oh man thanks! It was a late night. Would you even need the chemical part of this if you already have a torch? Couldn't you just use the torch and lathe? I realize that defeats the point of the experiment, haha just saying. BTW what is the music in that video? Reminds me of OPM. Ya you could just melt the glass, but you know... science. The song is Hot Guacamole by Paul Barman ft. MF DOOM. For science is always a good enough answer! Thanks his other stuff is pretty good. Thanks for the new artist! :D You should check out MC Chris or MC Frontalot if you like Nerdcore rap. It seems highly unlikely. I was under the impression they were using diamond tipped blades to score the glass in those movies. I find it amazing that simply using lye and heat you can dissolve glass like this, but I'm having a real hard time finding a practical application for the process you have described here. I suppose that if you had a stencil and an appropriate way to adhere the stencil to a piece of glass you could do some interesting etchings and cut outs. Do you know of any adhesives that can resist the causticness of the lye? AH HA I figured it out! 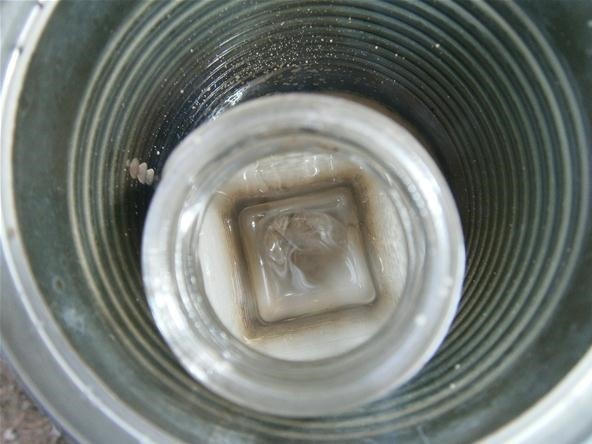 If you wanted to etch or cut through glass using something along the lines of this technique, it is possible to combine lye, water and a gelatin medium to create a paste that should be caustic enough to cut through the glass. I'm ratios between the three would require adjustments. I also found that sticky back vinyl sheets can be attached to glass and the paste can be brushed over it with out also dissolving the vinyl. I'm thinking a 50% lye, 25% water and 25 % gelatin mixture plus added heat could produce some interesting works of science based art! Really great idea SF ZooKeeper! I would love to see a corkboard post if you try this yourself! Feel free to contribute articles or pictures or video to the community! That will not work. A hydroxide solution is not enough to react with glass, it must be heated to high temperature, at which point gelatin will liquefy. That's assuming you had a gelatin that the hydroxide wouldn't destroy to begin with, which is highly unlikely. If you want to etch specific patterns you will need to coat the glass with something the hydroxide will not eat, such as a chemical resistant rubber, and scratch the pattern through the protective layer before immersing it in molten hydroxide. LYE+Sodium Hydroxide+water+Torch+steel container= sodium silicate? Can I use this sodium silicate in my forge? is this the same as water glass?